This book probes the complex interweaving, across time and cultures, of violence and non-violence from the perspective of the present. 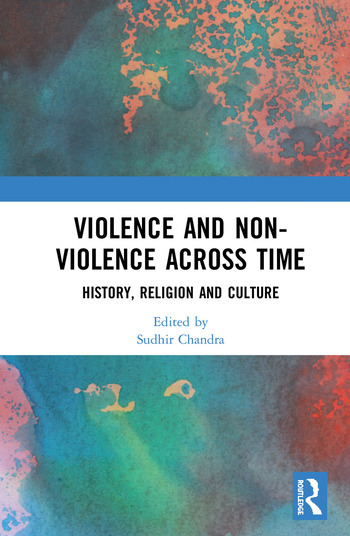 One of the first of its kind, it offers a comprehensive examination of the interpenetration of violence and non-violence as much in human nature as in human institutions with reference to different continents, cultures and religions over centuries. It points to the present paradox that even as violence of unprecedented lethality threatens the very survival of humankind, non-violence increasingly appears as an unlikely feasible alternative. The essays presented here cover a wide cultural–temporal spectrum — from Vedic sacrifice, early Jewish–Christian polemics, the Crusades, and medieval Japan to contemporary times. They explore aspects of the violence–non-violence dialectic in a coherent frame of analysis across themes such as war, jihad, death, salvation, religious and philosophical traditions including Buddhism, Christianity, Judaism, Hinduism, Islam, mysticism, monism, and Neoplatonism, texts such as Ramayana, Mahabharata and Quran, as well as issues faced by Dalits and ethical imperatives for clinical trials, among others. Offering thematic width and analytical depth to the treatment of the subject, the contributors bring their disciplinary expertise and cultural insights, ranging from the historical to sociological, theological, philosophical and metaphysical, as well as their sensitive erudition to deepening an understanding of a grave issue. The book will be useful to scholars and researchers of history, peace and conflict studies, political science, political thought and cultural studies, as well as those working on issues of violence and non-violence. Sudhir Chandra is a historian based in Delhi, India. He has been associated with several universities and centres of advanced learning, such as the Nantes Institute for Advanced Studies; Indian Institute of Advanced Study, Shimla; Institute for Advanced Studies in the Humanities, Edinburgh; Banaras Hindu University; Aligarh Muslim University; Jamia Millia Islamia; Maison des Sciences de l’Homme, Paris; Melbourne University; Bellagio Study and Conference Center; University of Chicago; Cornell University; Tokyo University of Foreign Studies; Indian Council of Historical Research; and Indian Council for Social Science Research, New Delhi. Among his publications are Gandhi: An Impossible Possibility (2017), The Oppressive Present: Literature and Social Consciousness in Colonial India (2014/1992) and Enslaved Daughters: Colonialism, Law and Women’s Rights (1998). His works seek to understand the kind of social consciousness that developed in India under the colonial impact and the idea of non-violence.